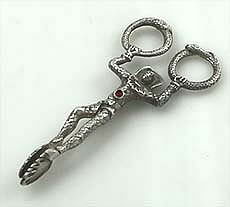 A good quality cast figural German 800 silver antique sugar nips with red stones set in the front and back. Excellent detail and weight. 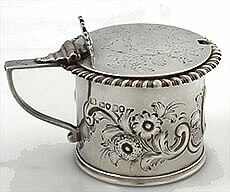 An English silver mustard pot with engraved lid and and chased body and applied handle. The lid is hinged and monogrammed. The interior is gold washed. Weight 4.60 troy oz. Height 2 1/4"; diameter at the top 3". Maker John & Edward Barnard. Dated for London 1854. A heavy quality antique sterling Union Square Tiffany cup with satin finish and engraved detail dated 1873. The word "Edith" is engraved in the cartouche in Japanese style. Applied beaded rim and a reticulated decorative band at the base. Fully marked on the base. Gilded interior. The handle has applied Japanese style decoration matching the base. Weight 6.8 troy ounces. 3 1/2" tall. 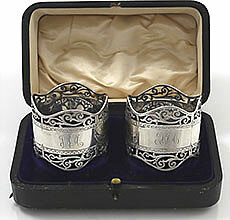 A pair of antique sterling silver pierced napkin rings in the original fitted case monogrammed with script monograms in the center. 1 3/4" wide. Sheffield, 1910. An antique French hallmarked silver mesh purse with hand reticulated frame on both sides, the front frame containing amethysts and garnets set into the frame. Central divider for separating the interior compartments. Frame 6" across by 5 1/4" long without the drops. Condition: One amethyst is chipped and a four or five rings missing from the mesh but no tears and the mesh is firmly on the frame. 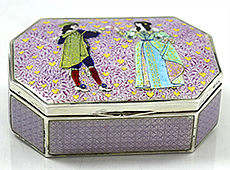 An unusual German 925 sterling box with lavender enamel on the sides and a romantic figural scene with the clothing of the figures in special luminescent enamel. The top of the box has a pattern of small gold metallic hearts and an engraved leaf pattern throughout. The side of the box has an engraved geometric pattern under the enamel. Condition: The top is perfect. The sides have four areas of enamel surface loss in the corners of the panels, not quite through to the silver. Weight 11.10 troy ounces. 4 3/4" by 3 1/4" by 1 1/2" tall. Gilt interior. A large impressive quality German sterling silver wager cup by the Hanau firm Ludwig Neresheimer also marked with the London import marks for 1913 by Berthold Muller. The cup measures 11 3/4" tall and has a weight of 16.05 troy ounces. 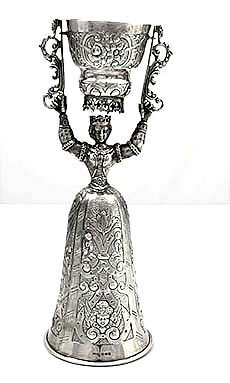 Chased with cherubs, ribbons and scrolls by hand the figurine has a crown and cast supports for the cup which pivots on pins from the arms. Excellent condition. 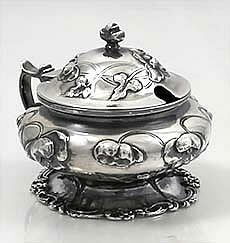 An antique sterling silver mustard pot by the Tennant Company of New York with hand chased art nouveau detail. The lid hinges back to open. The decoration is of poppies with tendrils and the chasing extends into the base. 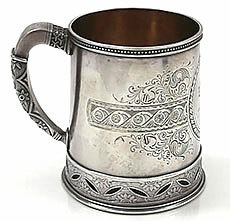 Weight 5.15 troy ounces; Height 3"; diameter 3 1/2"
A German 800 silver antique wager cup with ornate cast detail and a pivoting cup at the top supported by two arms. Circa 1900. 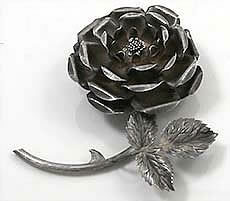 A fine quality sterling silver table decoration in the form of a rose with stem and leaves. 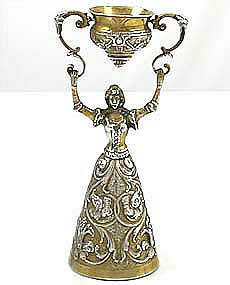 The maker is Janna Thomas from New York who went to Taxco, Mexico in 1965 to be a designer. She had clients such as Tiffany and Cartier. Length 4 3/4"; diameter of flower 3 1/4". Marked Sterling, Janna, Mexico, Cromwell, 19A. A German 800 silver trinket box with hinged lid marked with pseudo-marks on the base, probably Hanau 1900. The decoration is of cherubs at work with floral swags and ornate chasing on the sides. Four cast and applied feet on the base. Lightly gilded interior. Length 4 5/8" square by 2 1/8" tall. Good condition. 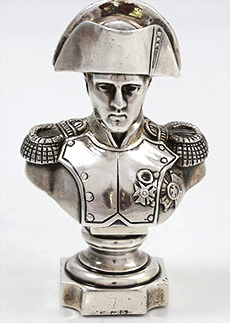 A detailed silver bust of Napoleon made in Hanau circa 1900 with a light gold wash. Import marked by Berthold Meuller in England. Height: 5 1/2". Weight: 8.60 troy ounces. 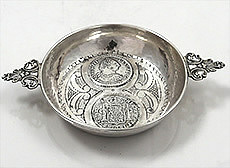 A large Spanish silver wine taster with hand hammered sides and inserted medallions. Two cast handles. 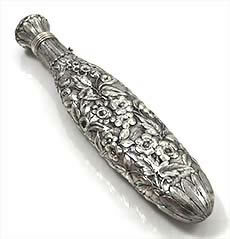 Hallmarked Circa 1930. 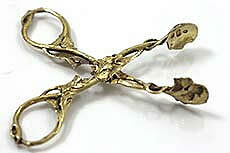 Diameter 4 3/4"; length across the handles 7 1/8"; height 1"; weight 5.10 troy ounces.